Whether creating films to honor the reality of political imprisonment or humanize those living with schizophrenia; seeking to “canonize the saints of becoming” in physical and metaphorical sculptures; or using grayscale to depict the African American body in portraiture, as a way of challenging the concept of color-as-race–Seeing and Being Seen brings together three artists whose work shows how identity is both formed and performed, and how this process can be obscured, embraced, and exalted to create a culture of possibility. Ghetto Gastro. Photo by Mackenzie Stroh for Travel and Leisure. Ghetto Gastro. Photo by Miles Griffis for Flaunt. 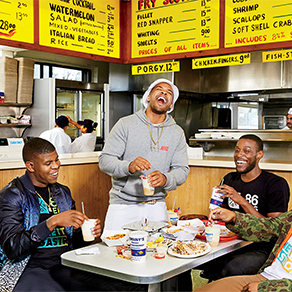 Ghetto Gastro. Photo by Krista Schlueter for Vogue. 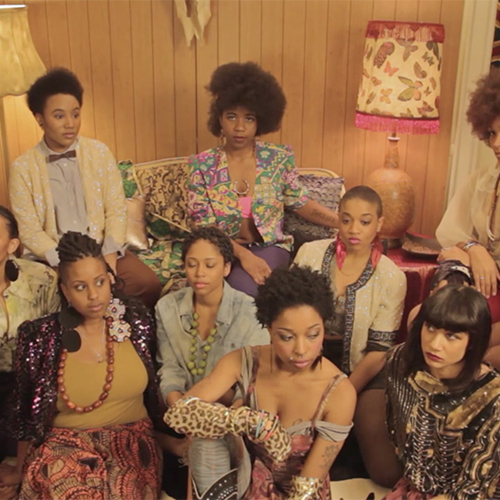 TheeSatisfaction “QueenS” (film still), 2012. Directed by dream hampton. 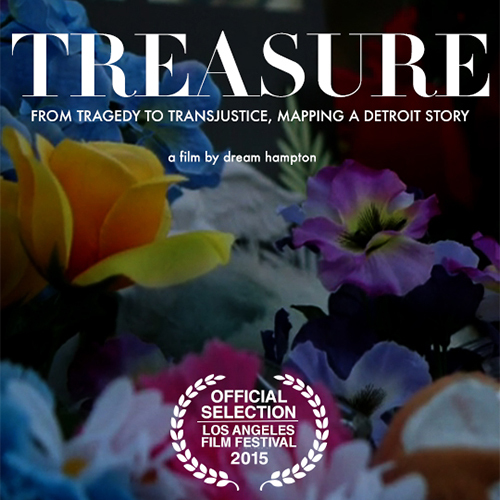 Treasure; From Tragedy to Trans Justice, Mapping a Detroit Story, 2015. Image courtesy of the artist. Jay Z: 'The War on Drugs Is an Epic Fail’. 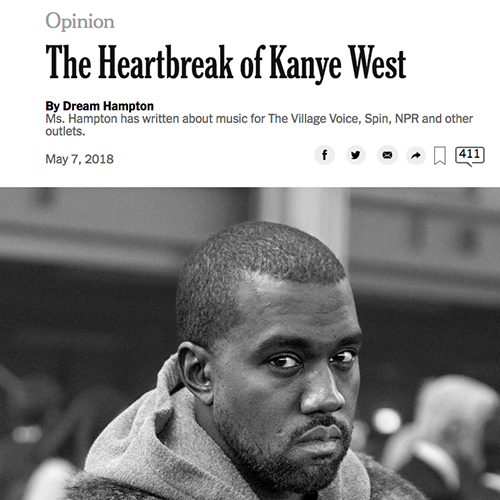 The New York Times, 2016. 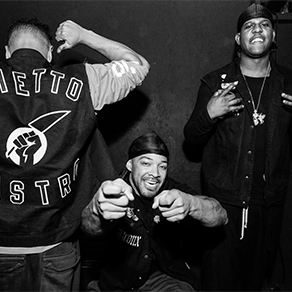 Produced by dream hampton. dream hampton is a writer, award winning filmmaker, and organizer. hampton’s articles and essays have been published in more than a dozen anthologies and in The Village Voice, The Detroit News, Spin, Essence, NPR and Harper’s Bazaar. 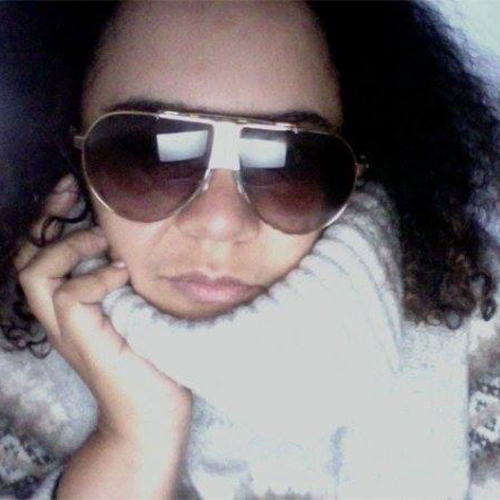 She collaborated with Shawn “Jay Z” Carter on the 2010 New York Times bestseller, Decoded. A 2014 Film/Theatre Kresge Fellow, hampton's film credits include: Director: Treasure: From Tragedy to Transjustice, Mapping a Detroit Story; Director: Black August (2010); Director: I AM ALI (2003); Co-Executive Producer: An Oversimplification of Her Beauty; Co-Producer: BET Black Girls Rock (2010-2015); Writer: BET Honors Awards (2010-2015); Associate Producer: The Russian Winter (2012); and Co-Producer: Behind the Music: Notorious B.I.G. (1999, Emmy). She directed the music video QueenS for TheeSatisfaction which NPR named one of the most stylish music videos of 2012.
hampton is a board member of online civil rights organization Color of Change, Detroit’s Young Nation and Grace Lee Bogg’s youth arts collective Detroit Summer. She consults for MomsRising.org, Drug Policy Alliance and JusticeLA. 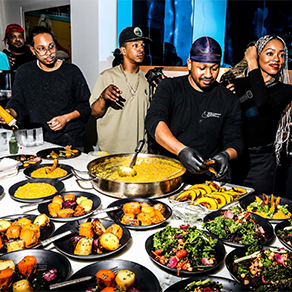 Additionally, hampton was the 2015 Visiting Artist at Stanford University's Institute for Diversity in the Arts where she taught From Moments to Movements; New Media, New Narratives a course on 21st century activism and organizing. Untitled in the Rage (Nibiru Cataclysm), 2015. Solomon R. Guggenheim Museum, New York Purchased with funds contributed by Stephen J. Javaras. 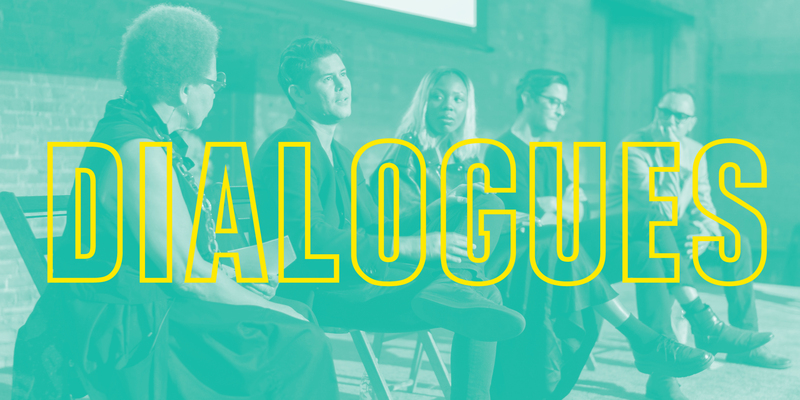 Triennial 2015: Surround Audience, 2015. New Museum, New York. Transsexual Empire, 2018. PPC Philipp Pflug Contemporary. Frankfurt am Main, Germany. 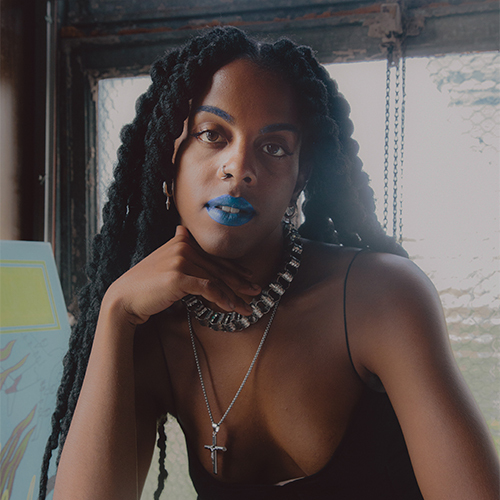 Juliana Huxtable is an artist, poet, performer, and musician who often uses her own body as her primary subject. 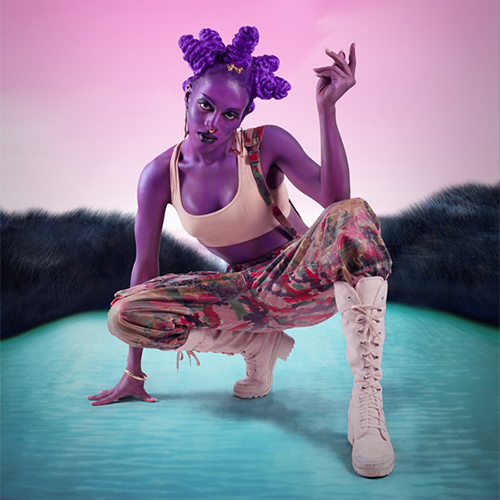 Spurred by a diaristic impulse, she reflects upon her gender transition and often links her own physical evolution to a dialogue concerning avatar, science-fiction, radical black and queer movements, and aboriginal tribes, among other social phenomena. Huxtable's work primarily focuses on archiving and abstracting representations of art history, the internet, and the expectations of gender politics–using portraiture to address her “wounded attachment to the fantasies of a black American aristocracy”. She is a member of the New York-based collective House of Ladosha, and originally found her way into the downtown club scene by founding #SHOCKVALUE in Queens, New York. Huxtable has exhibited at Franklin Street Works, Stamford, Connecticut, among other galleries. She has performed at venues including the Whitney Museum of American Art, New York, Museum of Contemporary Art, Los Angeles, and the White Columns Annual, New York. Her poetry and visual work was notably featured in the 2015 Triennial at the New Museum. Miss Everything (Unsuppressed Deliverance), 2014. Image courtesy of the artist. 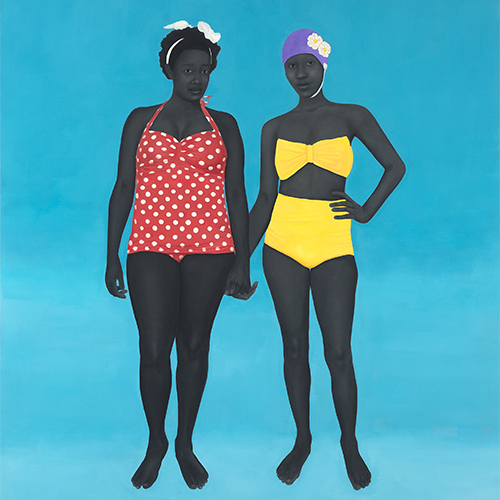 The Bathers, 2015. Image courtesy of the artist. Mother and Child, 2016. Image courtesy of the artist. 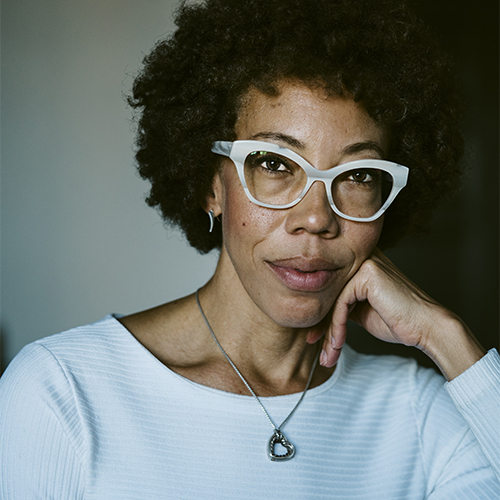 Amy Sherald (American b. Columbus, GA 1973, lives Baltimore) received her MFA in Painting from Maryland Institute College of Art (2004) and BA in Painting from Clark-Atlanta University (1997), and was a Spelman College International Artist-in-Residence in Portobelo, Panama (1997). 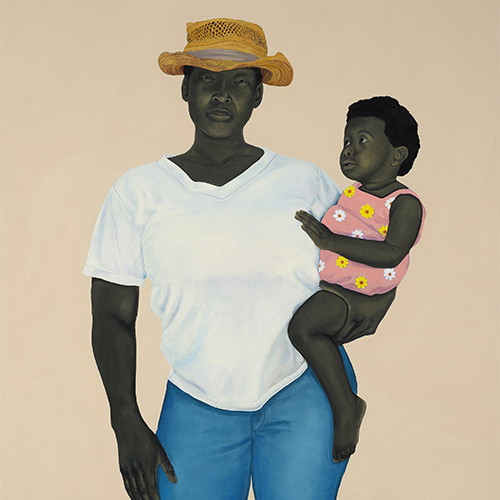 In 2016, Sherald was the first woman to win the Smithsonian National Portrait Gallery’s Outwin Boochever Portrait Competition; an accompanying exhibition, The Outwin 2016, has been on tour since 2016 and opens at the Ackland Art Museum, University of North Carolina, Chapel Hill, NC in June 2018. 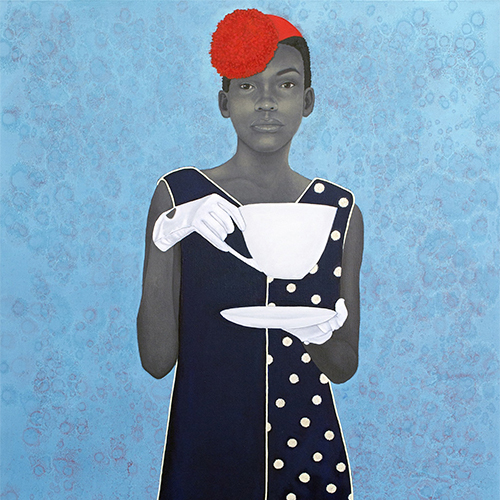 Sherald has had solo shows at venues including Monique Meloche Gallery, Chicago (2016); Reginald F. Lewis Museum, Baltimore (2013); and University of North Carolina, Sonja Haynes Stone Center, Chapel Hill (2011). In May 2018, she will present a solo exhibition at Contemporary Art Museum, St. Louis, MO. Group exhibitions include Southern Accent, Nasher Museum of Art at Duke University, Durham, NC (2016), which travelled to Speed Museum of Art, Louisville, KY (2018), and Face to Face: Los Angeles Collects Portraiture, California African American Museum, Los Angeles (opens July 2018). Residencies include Odd Nerdrum Private Study, Larvik, Norway (2005); Tong Xion Art Center, Beijing, China (2008); Creative Art Alliance, Baltimore (2016); and Joan Mitchell Foundation, New Orleans (2018). Public collections include Embassy of the United States, Dakar, Senegal; National Museum of Women in the Arts, Washington, D.C.; Smithsonian National Museum of African American History and Culture, Washington, D.C.; Smithsonian National Portrait Gallery, Washington, D.C.; The Columbus Museum, Columbus, GA; Kemper Museum of Contemporary Art, Kansas City, MO; and Nasher Museum of Art, Durham, NC. 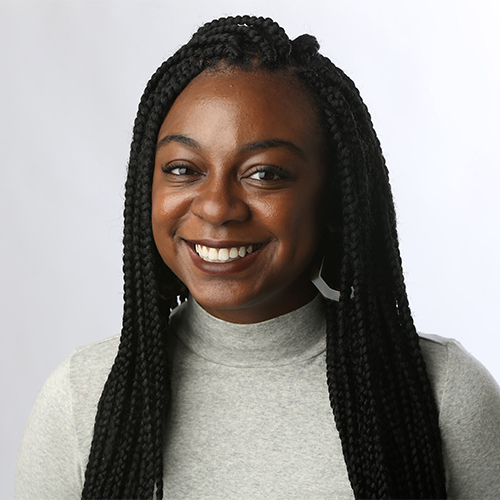 Jazmine Hughes is an associate editor at The New York Times Magazine, responsible for editing the long-running and beloved column "Letter of Recommendation," as well as the back page of the magazine. Named to Forbes Magazine's 30 Under 30 list in 2018, she was previously the contributing editor for The Hairpin, and a fact checker at New York Magazine. Her work has also appeared in The New Yorker, Elle, Cosmopolitan, and The New Republic. On the side, she co-created Writers of Color, a database to help assigning editors discover more diverse writers. She has taken the cause of diversity to the magazine, as well, and recently edited interviews with Maxine Waters, Dylan Marron, Billie Jean King and Tiffany Haddish. A lifelong Detroiter, Pastor Barry Randolph was born and raised on the lower eastside. 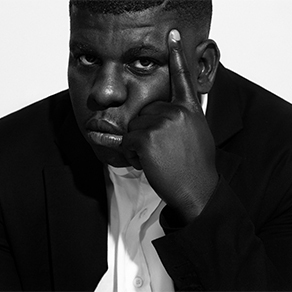 He is a graduate of Martin Luther King High School and attended Wayne State University. With a background in business he co-owned a distribution company, health food store and a fine dining restaurant in the 80’s and 90’s. Feeling something missing in his life he started attending Church of the Messiah where he truly found his calling. He began as a volunteer tutor for the after-school programs and held varies positions such as the Sunday School Teacher, Youth Director and Worship Leader. In June 2002, he became an ordained priest and now pastors Church of the Messiah. Under his leadership, the congregation has grown from 41 members in 2002, to over 300 members today. Church of Messiah prides itself on being a multi-ethnic church but does have a large population (60%) of African American males under the age of 30. Messiah currently includes an employment and computer Lab, an audio and video production lab (Messiah Media), a bicycle workshop, a leather goods, a mentoring program, a drug recovery treatment program and a full marching band. Pastor Randolph also currently serves as a board member of the Church of the Messiah Housing Corporation which is one of the oldest community development corporations in the country. 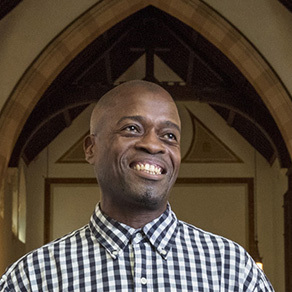 Pastor Randolph’s tireless efforts have not gone unnoticed, he and the church have been documented in a few documentaries, such as Detroit Renaissance of America (an Annenberg creation), as well as Lemonade Detroit and The United States of Detroit (short films depicting the innovation of Detroiters). Pastor Randolph is establishing himself as one Michigan’s leaders in innovation, re-invention and empowerment.